Introduction: Gena Philibert-Ortega is a genealogist and author of the book “From the Family Kitchen.” In this guest blog post, Gena addresses the problem that it’s often hard to find information about our ancestors when they were children. One solution? Look for their participation in fashion and coloring paper doll contests run by newspapers. Previously in my article “What about the Kids? Researching Your Family Tree’s Children” I wrote about places to find children’s names in newspapers. I commented on how as researchers we genealogists often ignore the childhood of our ancestors because children did not generate the quantity of records that adults left behind. The wonderful thing about newspapers is that they are the great equalizer: they record the stories of everyone whether rich or poor, young or old. 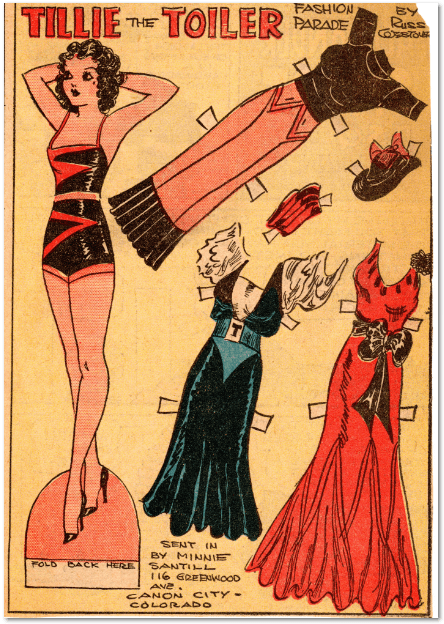 While there can be no doubt that some people get more articles written about them than others, you can find ancestors’ names in all sorts of places in the newspaper—even in something as unexpected as a paper doll contest. 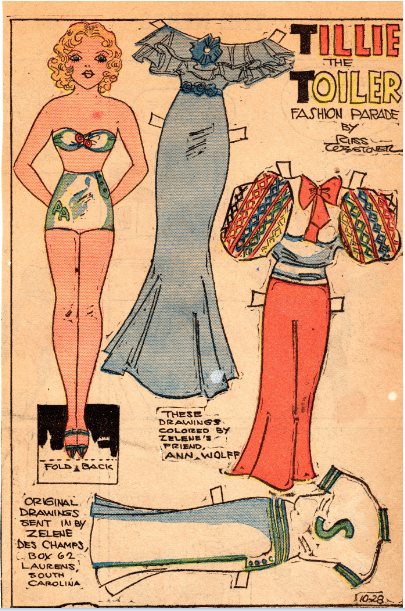 Not only would the comic strip authors themselves provide dolls and wardrobes in the Sunday papers, they would solicit contributions from readers. 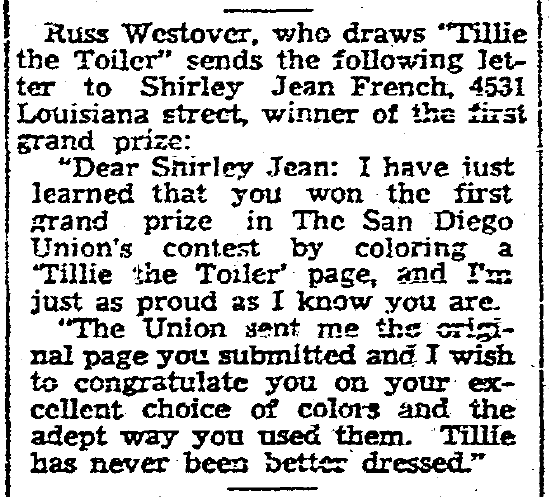 One comic strip that encouraged readers to design outfits was “Tillie the Toiler.” Tillie, drawn by Russ Westover, ran in newspapers from 1921 to 1959. Tillie toiled at her jobs as a stenographer, secretary and model. Her life as a single working girl was the focus of the strip and the character of Tillie was also featured in a couple of movies. 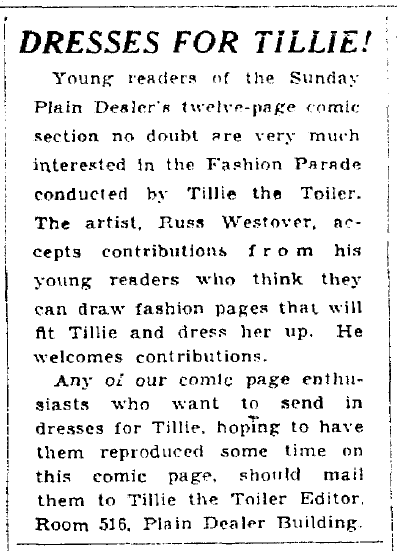 Here’s a call to the young readers of “Tillie the Toiler” to submit designs for the Fashion Parade. I’m always on the lookout for unusual places to find ancestors’ names. Searching through those newspaper paper doll fashion contests can yield the names of the winners; those people chosen to have their doll and/or wardrobe published. Not only are the contest winners’ names and cities printed but sometimes even street addresses and, occasionally, the winners’ relationships to other budding fashionistas—such as in this example, where friends Zelene Des Champs and Ann Wolff from South Carolina submitted entries together. Girls were not the only ones who submitted entries; boys and even married women from the United States and Canada submitted their doll and fashion drawings. While today’s American children may not be as engaged with newspapers as previous generations, for their grandparents and great-grandparents the Sunday comics page was not just a place to get a few laughs—it may have been a place to leave their mark on the world. Genealogy Tip: Examine every part of a newspaper when doing your family history searches. You never know where a long-sought ancestor’s name might turn up—an obscure ad, a paper doll contest, a family recipe—providing a little more detail to help bring that name on your family tree to life. List of 25 Historical U.S. Newspapers Going Online!